Home / Blog / HowTos / How Much Does It Cost to Hire a PHP and jQuery Developer in Ukraine? How to Hire a PHP and jQuery Developer? Employers don’t like the idea of looking to hire a jQuery developer just by entering their requirement into the Google search form. Outstaffing solutions perfectly fit this type of situation. While offering you to relax and wait till we perform all the job, we will find ideal candidates for a team of dedicated PHP and jQuery developers positions in order to launch your project as soon as possible. You can apply with your request in Mobilunity and our professional HRs will surely find the exact type of programmer you need. 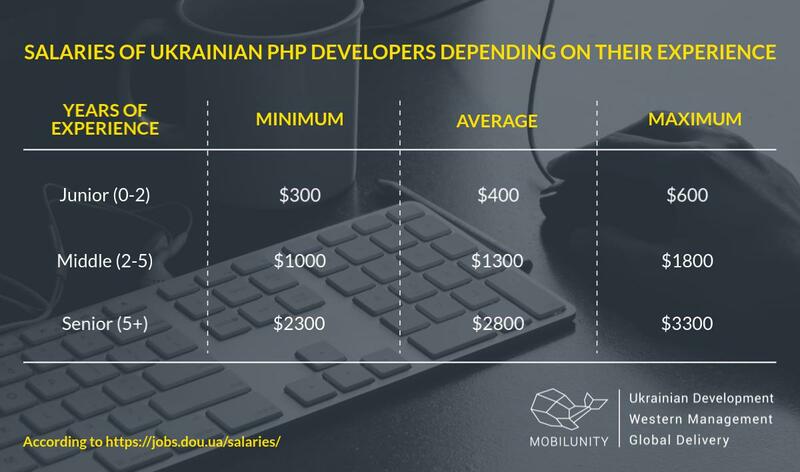 The average middle PHP web developer salary in Ukraine is $1300 as you can see from the table below. They can be different, depending on the size of the project or company. Middle jQuery (JS) developer salary ranges from $1700 to $4000, which depends on additional skills this programmer acquires, like experience in Node.js, AngularJS, Gulp, Grant, etc. Middle PHP and jQuery developer salary is $3000 on the average, according to Djinni, but sometimes a bit less, depending on the size of the company. The average middle PHP programmer salaries with knowledge of jQuery in USA is $60 000/year, according to the Payscale resource. PHP coder without knowledge of jQuery earns approximately $50 000/year, which is almost 17% lower. In the chart below you can see the dynamics of searches for “PHP jQuery” combo in Google. Nevertheless you can notice, that it has declined a bit through the period of 5 years, it still stays quite popular within the web development niche, and our dedicated PHP developers use it as well. Nowadays employers often encounter the lack of professionals on their local market, that is why they are looking for candidates in other countries. It might be not an easy task to hire PHP developer at affordable price instantly. While working with Ukrainian developers, you can notice that they have high level of education, talent, flexible, yet professional approach to projects, convenient location for outstaffing and, of course, reasonable cost. Check out our another article dedicated to Perl programmer salary. If you have any questions according salaries of developers, contact us or leave a comment.